iPad 3, Kindle or plain old book? – Write Lah! 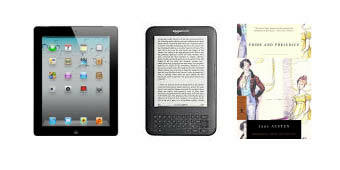 iPad 3, Kindle or plain old book? Certain things lead to promiscuity. Beholding a gorgeous woman or a particuarly handsome man does not per se lead to one being involved with many partners, but it most definitely helps. So it is with the iPad. With the huge selection on the iBooks app, with now with even sharper stunning covers (due to its new Retina display), I must confess to being rather greedy in my downloading. This had led to my reading more than several books at the moment. Such promiscuous reading is certainly a new habit for me. I jump around from Tolstoy to Joyce then to King and T.S Elliot not to mention a raft of non-fiction books on subjects I never thought I had the remotest interest in. So you’d like to know which is better as an ebook reader, right? The iPad or the Kindle? I’ve read a heap of other bloggers on this question. They all go for the Kindle. Yes, the Kindle (and I really love mine still) is not a distraction machine. It’s made for reading. You’re not liable to start playing Angry Birds on checking the latest news, downloading yet another app or seeing who’s updated their Facebook status. Also, the Kindle hardly weighs anything. You can wield it dexterously with one hand. I’ve now discovered though that the iPad trumps this advantage in one place. That’s when we’re lying in bed together. Just iPad and I. With the iPad in a stand up case, I prop her delicately on my stomach and we’re in action. Now, head upon a soft pillow, I’m reading hands free! I occasionally stroke her, just to change pages. But other than that, only my eyes (and sometimes my brain) are doing the work. So, yes, the iPad wins over the Kindle. Only in bed, of course! The Kindle still triumphs if you’re reading elsewhere. Without any reflection on its screen, the Kindle is perfect outdoors. When I lazed about at a beach resort several months back, I counted at least four people reading Kindles on their deck chairs. The iPads were used strictly in the restaurant. Oh, and what about the good old book? I still read those too. I’m reading a particular large hardback at the moment. Whilst in bed (well, so far I’ve only been reading it in bed), I find that a cushion on my belly helps soften its rather heavy spine. I like the feel of its dry crispy pages on my fingers. And after I’ve finished it, I’ll place it on my bookshelf for myself and all my family and friends to admire. So which to I prefer? Well, all three, of course! Ah… But an iPad (alas and alack only the 2 not the 3) can let me read kindle… Nook… AND “Wriring” (the UK magazine that I can only get on the iPad… Not kindle, nook or print easily)! Sigh! Came here searching for a recommendation, and found besotted book lovers instead. Amazing isn’t it. As long as we exist, technology makers will continue to remain in business – the pretty paper books, the kindle, the iPads and all the things we haven’t imagined yet. Ishahblr – I can’t agree with you more. As long as money’s to be made, they’ll keep churning the stuff out. Oh I forgot to mention, the Kindle battery lasts much longer than the iPad.